October 7th is dedicated to Our Lady for the Rosary. The feast of Our Lady of the Rosary was instituted to honor Mary for the Christian victory over the Turks at Lepanto on October 7, 1571. The Battle of Lepanto was a great sea battle and the Christians were outnumbered by the Turks – 7 to 1! 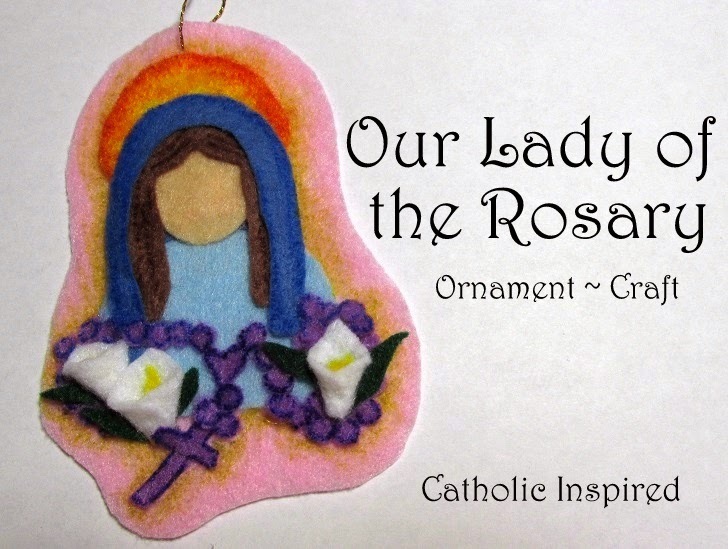 Pope St. Pius V asked that all Christians pray the Rosary. Then, God gave the Christians an incredible victory! Read more about the battle HERE. Elizabeth and I created a new ornament for the occasion. Cut out the parts like those shown above. We used a hole-puncher to make the little purple beads. If your hole-punch is not 100% sharp you may have to use scissors to finish cutting a few edges. 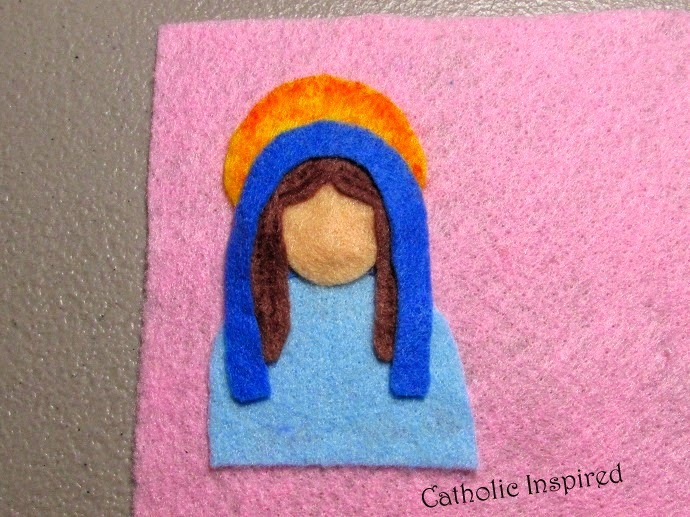 Also, the blue rectangle should have been the brown color (like her hair) - making it blue was a little mistake which we realized after we finished creating Mary. 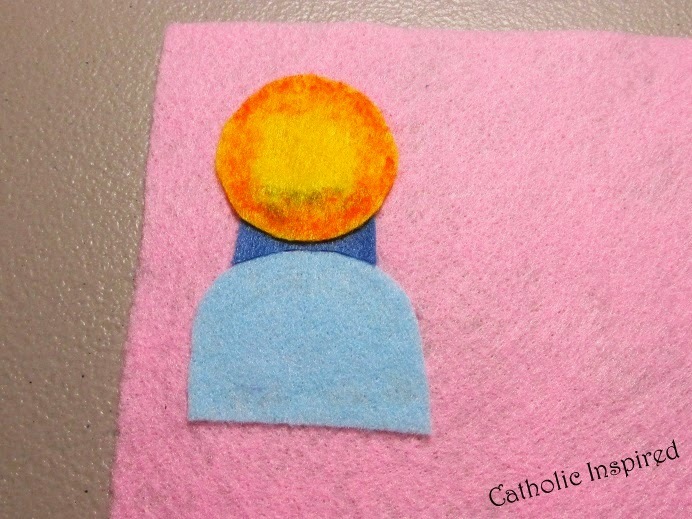 First, glue down the light blue body onto the pink background. 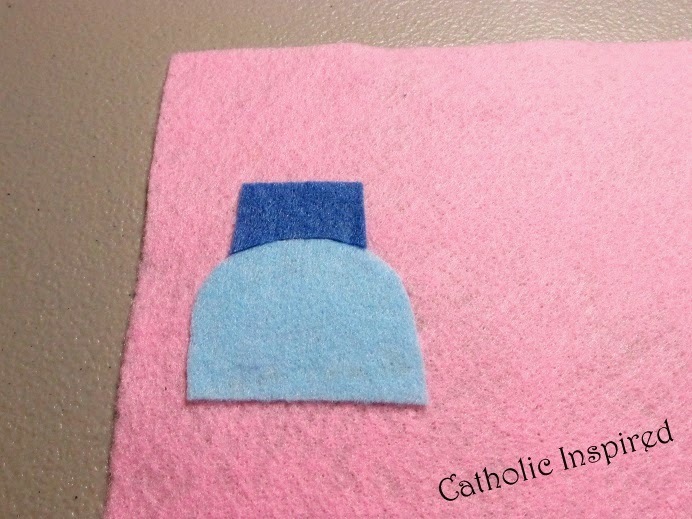 Then glue down the blue rectangle (which should have been brown). Cut the rectangle so it fits over top the light blue body. Add the halo which was out-lined with an orange Sharpie marker. 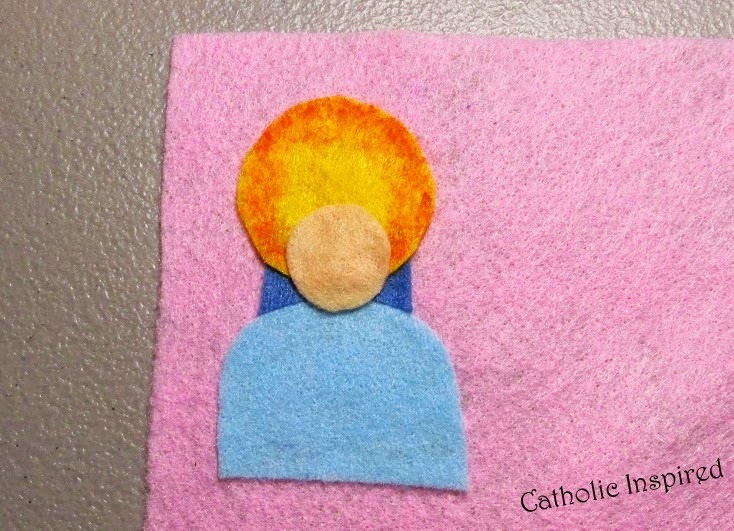 Add the head - be sure the head's chin touches and slightly covers the light blue body. 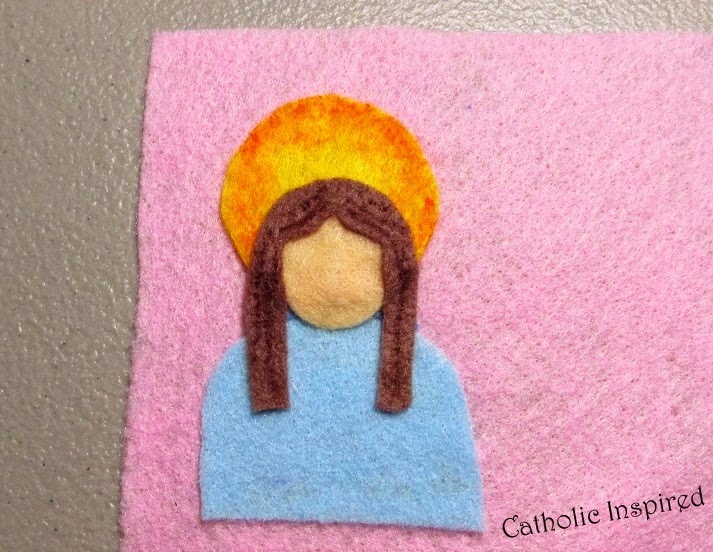 Now, add the hair, which has been detailed with a brown maker. Next add the veil. This can also be detailed/shaded with a light blue sharpie marker. 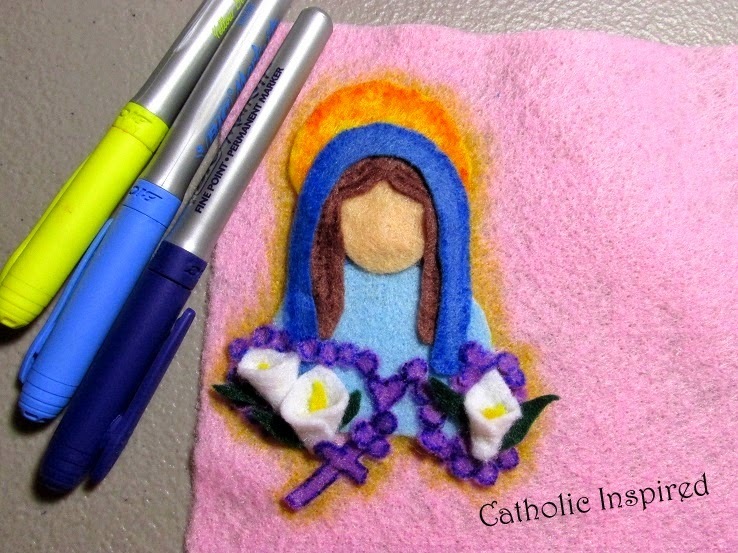 Now you need to make a few lilies (we made 3). A step-by-step picture is above. Add the lilies to the ornament -like above. 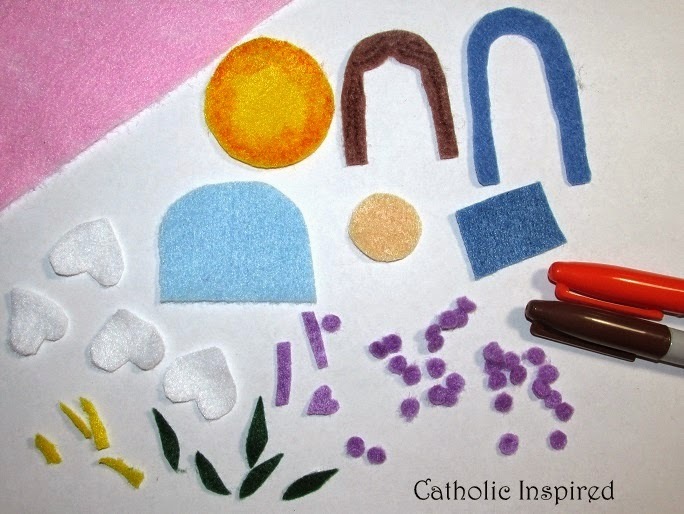 Next arrange the beads, heart-shaped Rosary center, and cross around the lilies. When you feel that you know how you want to arrange them, glue them down. 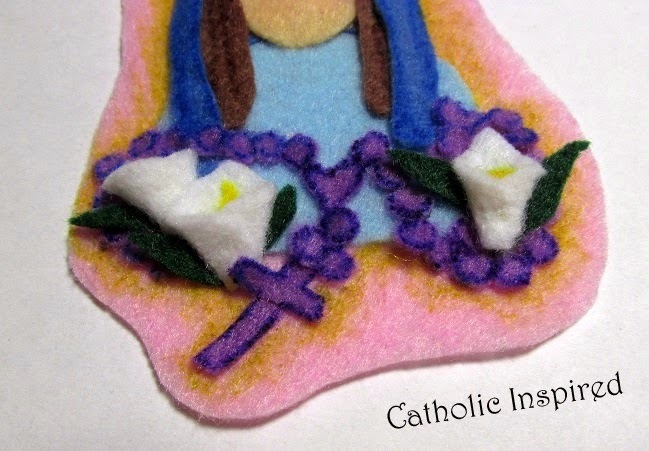 We added a purple out-line to the Rosary. 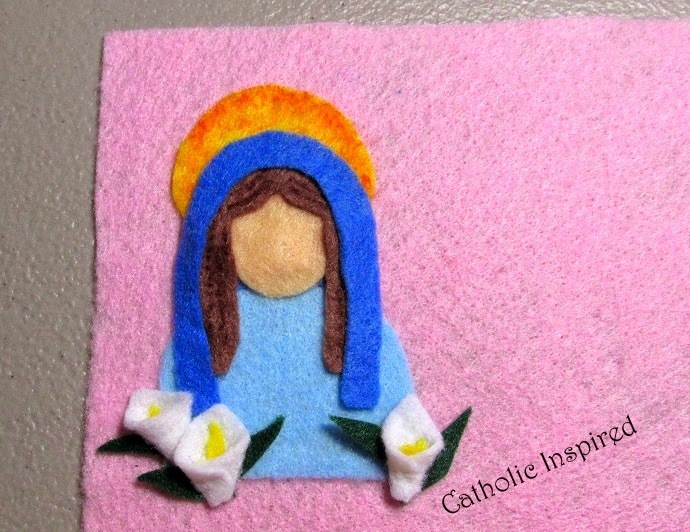 We also added a yellow outline around Mary to make her "glow" . Now cut out around everything and remove any extra pink background. Add the threaded loop and hang her up! Now, I'd like to ask a personal favor. My oldest brother is a fallen away Catholic, who's birthday falls on Oct. 7th. Please, pray for him! He's a great guy who would make an awesome soldier for Christ! God Bless you all with joy and peace! Thank you, ladies!! We are having a lot of fun with these! I just worry that you all are getting tired of see them! !